It is getting closer to summertime and I have been dreaming up warm and tropical soaps with hints of Island Coconut, Summer Fling and Fresh Mango scents. If you have a favorite warm and sunny blend be sure to let me know about it in the comments below. Next week is my last soaping week before Bramble Baby arrives so I want to make it a good one. =) Are you ready for the Facebook Photo of the Week? Read on to find more about the lucky winner below! This week’s super cute photo comes to us from Rachel at The Daily Scrub. She told us that these were her Lavender Oatmeal Cupcake Soaps and she just adored the scent. I thought they were very well-done, with clean photography. Rachel has a very unique style of soaping that works well for her brand that really makes it stand out. 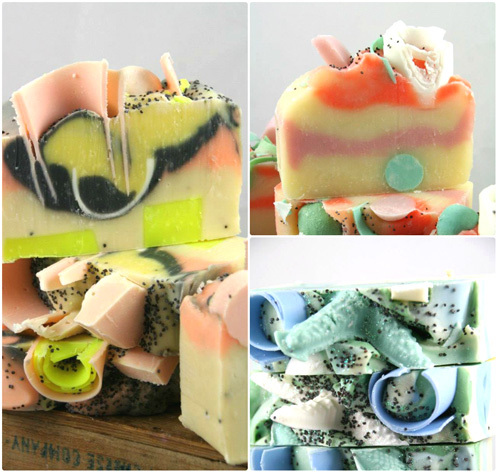 I love the colors and designs that she uses in her soaps and can’t wait to hear what you think. Thank you so much for being a great part of our fun soapmaking community, Rachel, and I can’t wait to see more from you. Expect a happy little package coming your way in the next few days! Rachel, your work is so pretty. The one with the pink & orange, with the minty dot, I want to pick up and take a bite out of it. Love the curls! I accidentally made some chocolate curls once when I was beveling a few bars. I’ve been saving them. Well, I am truly inspired now! It’s time for me to stop hanging on to them like they’re gold and give it a whirl. Oh, and I made a summer blend yesterday with 2 parts lilac, 2 parts baby powder, and one part yuzu. All Bramble Berry fragrances, of course. It is divine! When Anne-Marie picked Rachel’s soaps for this weeks FB Photo of the Week we were all in awe of her fun and funky designs. It definitely gave us inspiration to try a few new designs of our own. Be sure to keep us updated on your new curly soaps and if you get any pictures, we’d love to see them! 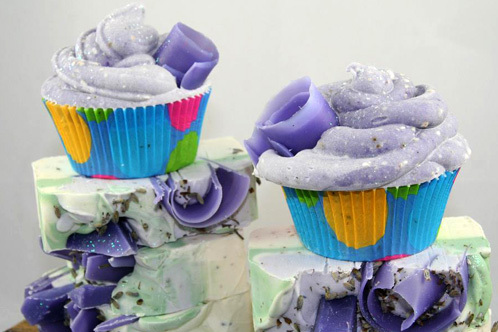 Love the soap/cupcakes. The embeds make them really cute! Congrats!